The “Images” Dialog displays the list of open images on your screen; each of them is represented with a thumbnail. This dialog is useful when you have many overlapping images on your screen: thus, you can raise the wanted image to foreground. The “Images” dialog is a dockable dialog; see the section Paragraaf 2.3, “Koppelen van dialoogvensters” for help on manipulating it. from the Tab menu in any dockable dialog by clicking on and selecting Add Tab → Images. In the Windows menu, there is a list of detached windows which exists only if at least one dialog remains open. In this case, you can raise the “Images” dialog from the image-menu: Windows → Images. 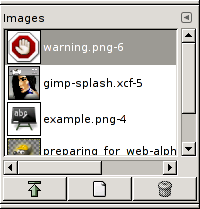 In multi-window mode, at the top of the dialog, a drop-list of open images appears if the “Show Image Selection” option is checked in the Tab Menu. At center, open images appear, as a list or a grid, according to the selected mode. The current image is highlighted in list mode, outlined in grid mode. With a double click on an image name, you raise this image to the foreground of your screen. With a simple click you select this image so that the buttons of the dialog can act on it. In the Tab menu for the “Images” dialog, you can choose between View as Grid and View as List. In Grid mode, the images are laid out in a rectangular array. In List mode, they are lined up vertically, with each row showing a thumbnail of the contents of the image, its name, and its pixel dimensions. You can change the size of the image previews in the dialog using the “Preview Size” submenu of the dialog's Tab menu. Three buttons at the bottom of the dialog allow you to operate on the selected image. These buttons are present if the “Show button bar” is checked in the tab dialog. You can get the same commands through the pop menu by right-clicking on the dialog. Duplicates the image window (not the image) of the selected image. This command works only on a image which is loaded without any window. Though images can be opened by the New Window command, if the image has been already loaded without window by a primitive procedure command (such as gimp-image-new, file-png-load, etc. ), it can not be unloaded even if its windows are closed to the last. Then use this command to close it.